A scene from The Berenstain Bears Live! Family Matters the Musical. 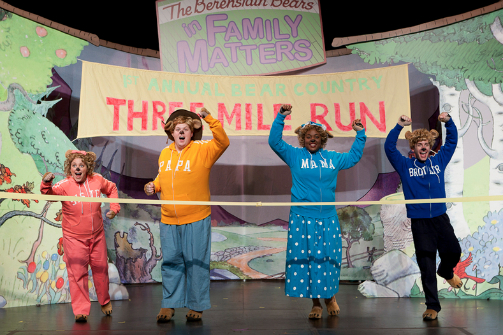 BOTTOM LINE: Five years running and going strong, The Berenstain Bears Live is a wonderful opportunity to introduce young audiences to the world of theater. It was my daughters’ first trip to Bear Country, six and three years old respectively, while our family’s equivalent of papa and mama bear faithfully accompanied them. We got the VIB tickets, Very Important Bear, to you Bear Country initiates. My girls were quite taken with the show and with the overall experience. The Berenstain Bears Live! Family Matters, the Musical is now in it’s 5th year playing off Broadway at the Manhattan Movement and Arts Center. Upon arriving at the theater the girls were given a pair of brown foam ears to don, and we headed downstairs to our seats. Cleverly the show’s producers have created a grassy knoll, aka a patch of grassy shag carpet front and center, for kids to sit or lie on for the duration of the show while their parents sit in chairs behind them. Following the show we all headed upstairs where young audience members could get their noses painted like the characters and pose for photos with the cast. These small and thoughtful touches make this show a piece of theater initiation perfect for young children. It was, in fact, my three year old’s first trip to the theater, and there were several children younger than her in attendance as well. The grass/carpet seating is particularly inspired as it gives a cozy place for young and wiggly bodies to engage with the show without the confines of sitting upright in a chair for an hour. And the play’s vibrant songs and musical transitions hold the attention of their young audience members, filled with puppetry, dancing, and short theatrical exchanges. Though the production is welcoming to the very young, the content seems pitched more to the elementary set (ages 5-7) with much of the story revolving around issues of school, sports practice, and homework. This production is actually an amalgamation of three of the popular storybooks from the 1980s “The Berenstain Bears Learn About Strangers,” “The Berenstain Bears’ Trouble at School,” and “The Berenstain Bears and Too Much Junk Food,” adapted for the stage by Michael Borton and Michael Slade. And while the content is wholesome and aims to bring positive moral messages to young children about sportsmanship, healthy habits and stranger danger, the theater production suffers from much of the out-dated cultural norms that the books and TV series possess. I guess I had been hoping for a more modern spin. I would have loved to see a Berenstain Bears for our current cultural moment with a wink and a nod for parents who grew up with the books in their youth. Sadly, gender roles are stuck in the 1960s, when the franchise was originally created by Stan and Jan Berenstain and later in collaboration with their son, Mike Berenstain. Father Bear works, and Mother Bear cooks and cleans. Brother Bear is a soccer star while his sister watches or cheers on the sidelines. As a mother to young girls I feel highly attuned to the gendered messages they get. And while I can tell you this wasn’t an issue for my children who loved the show, it does give me pause as a parent. I felt I needed to leave the theater and remind my girls that anyone can play sports, boys or girls. Truth be told, it’s quite possible the show’s creators did not have the leeway to liberally adapt these texts beyond their original content. Still, a parent can hope. But missed opportunities aside, the production is acted with energy and commitment, the costumes and set are whimsical and fun, and the show is full of wholesome family-positive messaging. My daughters are sleeping in their brown foam ears now. That ought to tell you something.